Value-based health care (VBHC) is a health care management strategy focusing on costs, quality and, most importantly, outcomes. The Tomaino Group supports leaders of healthcare organizations that are responding to the accountable care environment, especially those looking to transform their business processes to accommodate changes in reimbursement and new performance requirements by building models of value-based care. We provide continuing education offerings and other information products that support transformations in healthcare. Such transformations often require significant changes in care delivery models, staffing, compensation strategies, and performance monitoring– all while leveraging the use of new or existing information systems. In some special cases, new business lines may be required. Our products help industry leaders respond effectively to these challenges. 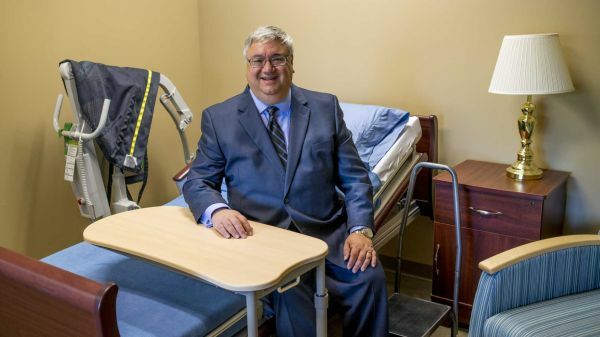 Joe Tomaino in a home health care simulation center he designed, which is used to prepare staff for new care management processes using tele-health technologies. The Tomaino Group is an NAB approved sponsor of continuing education units for nursing home and assisted living facility administrators. As architects of value-based care, we help healthcare providers and payers design innovative processes and leverage technology to transform care for high-risk populations of elderly, chronically ill, or recently hospitalized patients.